A perennial plant in Southeast Asia, lemon grass is a common ingredient in Thai and Vietnamese cooking, among other Asian cuisines. It has a lemony scent and tartness. It is used in the west for a number of purposes, including as a lemon substitute or reinforcing agent in herbal teas. Lemon grass grows wild in Sri Lanka, Malaysia and Indonesia. It requires a well-draining but humid growing environment, and will not tolerate hard frost. In the U.S., lemon grass is commercially grown in Florida, California and Hawaii. It is a clumping grass that forms mounding tufts. In a warm, tropical climates, it can reach 9 feet tall, but it seldom gets to 3 feet if you grow it in a temperate climate and bring it indoors for winter. 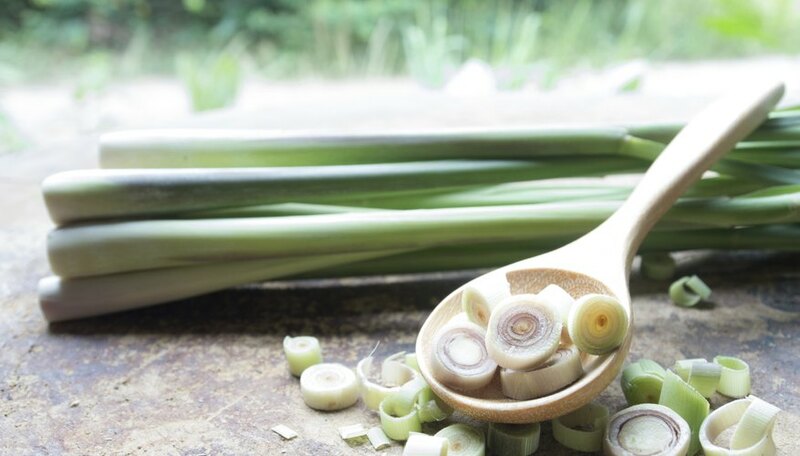 As a flavoring agent, lemon grass is common in Southeast Asian cooking, serving to provide both souring elements and fragrance to stews, soups, stir-fries and steamed dishes. In this role, it is also used as a flavoring for teas and tisanes. Lemon grass is used as a scenting agent in soaps, lotions and candles and also in traditional and herbal medicine. Lemon grass has a slender stalk and looks somewhat like a green onion. The stems are usually tough and fibrous, and only the central heart is tender enough to be eaten without a lot of processing. Lemon grass can be used in cooking in a similar way to cinnamon sticks or bay leaves: as a seasoning to be removed or left in a large enough piece so the person eating the dish can remove it. If you're going to remove it, tie it in a bundle with string then smash the edge with a heavy object to break up the fibers of the stem. It needs a liquid to release its oils, so it won't work in every dish. Fresh lemon grass can be ground and reduced to a paste, which can then be added directly to foods. Lemon grass is also sold as a dried, ground spice. Though much of the fresh flavor is gone, the citral scent and sourness remain, which is useful in soups, teas, tisanes and gravies, or in the water for steaming foods. Ground, pulverized fresh lemon grass is also sold in tubes in some produce departments. You can use the pulverized form directly in dishes. Lemon grass is strongly scented, and serves as a flavor base for many teas and tisanes. Often used in combination with other lemony ingredients, such as lemon peel, lemon verbena and hibiscus flower, it produces a sharp, highly fragrant brew. Chilled, it can serve as an iced tea with a lemonade character.